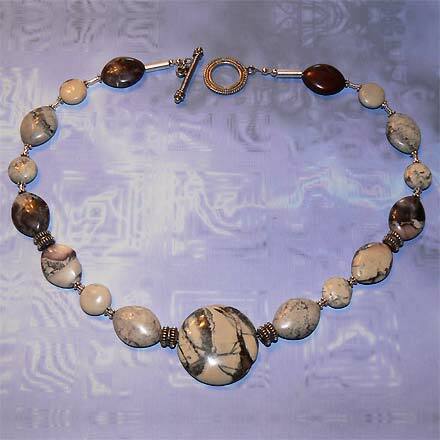 Sterling Silver Porcelain Jasper Necklace. See Closeup. 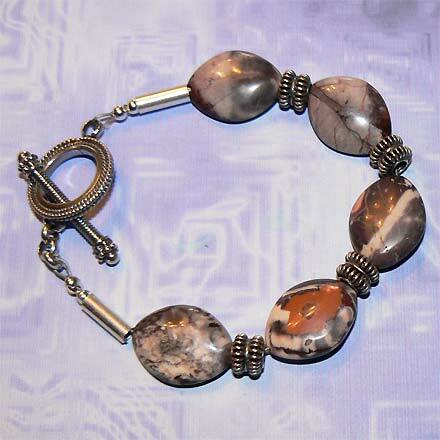 Sterling Silver Porcelain Jasper Bracelet. Porcelain Jasper is one of the many Jaspers where one can see impressions of nature. To me this is evocative of the winter at dusk or dawn, where the low light creates a wonderful pink and purple glow on the snow and in the air. Greys and blacks mimic trees and branches against mauve vistas. The pendant on the necklace can be turned around and worn in the opposite orientation to create 4 different scenes. as shown in the picture to the left/bottom. 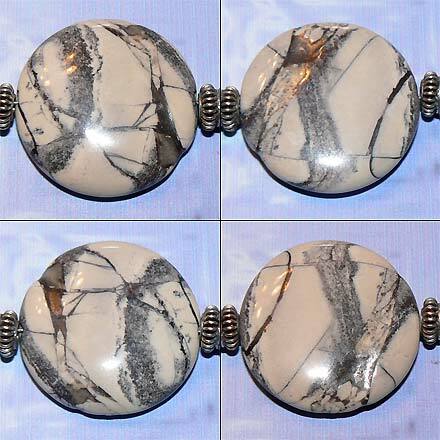 Fuzzy Stone Mystery Confusion Info: I have also seen Porcelain Jasper referred to as "Exotica Jasper." Also, I have seen Picasso Jasper referred to as "Exotica Jasper." Picasso Jasper, aka Picasso Marble, is actually a marble (limestone) and is lighter weight than this stone, Porcelain Jasper, which definitely has a denser "jasper feel." The confusion is probably because both stones resemble abstract paintings and drawings with drawn dark lines. However Picasso Marble/Jasper's color palette leans more toward black, grey, beige and brown, whereas Porcelain Jasper is more mauve, dull lavender, pink, white and charcoal. The word "porcelain" has the Latin root word "porc-", meaning "pig", and when one thinks of classic representations of pigs, one thinks pink, closer to this stone. Porcelain Jasper's markings are also much more random in form, whereas Picasso Jasper's markings appear much more deliberate.